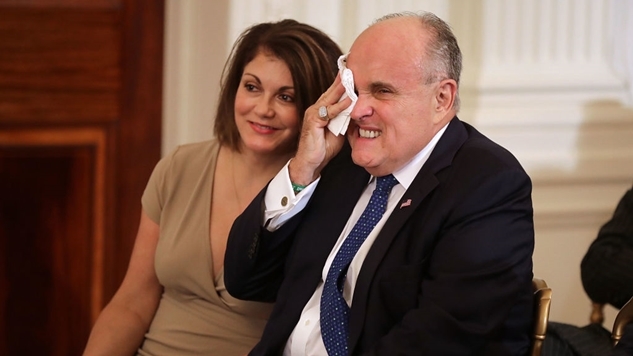 Rudolph W. Giuliani, Mr. Trump’s personal lawyer, confirmed in a telephone conversation on Friday that Mr. Trump had discussed the payments with Mr. Cohen on the tape but said the payment was ultimately never made. He said the recording was less than two minutes and demonstrated that the president had done nothing wrong. More, via @DanaBashCNN@GloriaBorger: Michael Cohen had other recordings of Trump in his records seized by FBI, per Rudy Giuliani & a source w/knowledge of Cohen's tapes. “Definitely all kinds of tapes out there,” one of the sources said. Liberals tend to have a responsible image of governance in their head for America's bluest states, but the reality is that the northeast is a hotbed for professional doofuses like Giuliani. I apologize for getting a little off track here, but it's difficult to cogently write in between sporadic bouts of hysterical, spasmic laughter. Despite the hilarity of incompetence produced by this triumvirate of lunacy, this is still a serious story, and I'll let the husband of Senior White House Adviser Kellyanne Conway, George Conway, elaborate on why a recording of this nature could be a pretty big problem for Trump. That tweet was posted in relation to the Stormy Daniels payment made by Michael Cohen just before the election, but if this discussed payment to Karen McDougal was made around the same time, it would also cause Trump to be in danger of violating that same FEC law. 1. The House impeaches Trump and the Senate removes him, giving us President Pence. 2. Trump’s cabinet invokes the 25th Amendment and removes him over unfitness for office, giving us President Pence. 3. We vote the Democrats into congress and the White House from 2018 to 2020. I don’t know about you, but door #3 sure sounds like the best option. Even old-school Republicans like George Will agree with me. Don’t put your faith in Robert Mueller to rid us of this (sometimes A+ comical) menace. Put your faith and energy into recruiting the voters needed to exercise our collective power to fight back against the kleptocracy which ruled us all long before there was a President Trump.